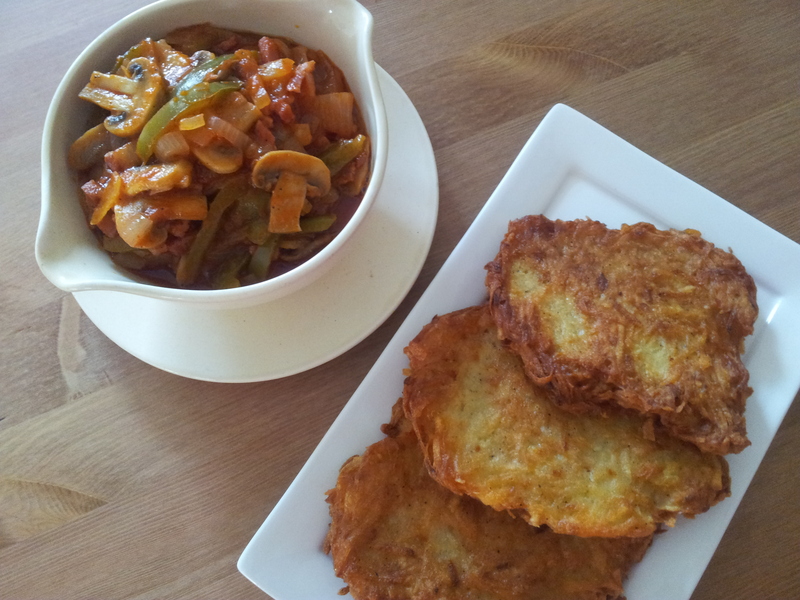 For sometime now, I wanted to make ”placki ziemniaczane”, or what You might know as ”rosti”. If you still don’t know what they are- they’re sort of a potato cake,made of grated potato,egg,some flour,seasoning,fried in hot oil and then baked.They’re very popular in Poland, and everyone knows how to make them.There’s a couple of ways of serving them, on their own, with sour cream, sweet-style with sugar and cream, or the way I decided to make them today- with a savoury sauce. 1) mix the grated potatoes, grated onion, flour,egg , salt & pepper, into a thick mix. Dollop heaped spoonfull’s of the mix onto the hot oil (not too hot) fry for about 5min each side, until golden and crispy,drain them off any excess oil-on some kitchen paper,then transfer the potato cakes onto a baking sheet and bake for about 15min, 180C, to cook them through and keep them hot, while you’re making the sauce. 2) the sauce is dead simple. 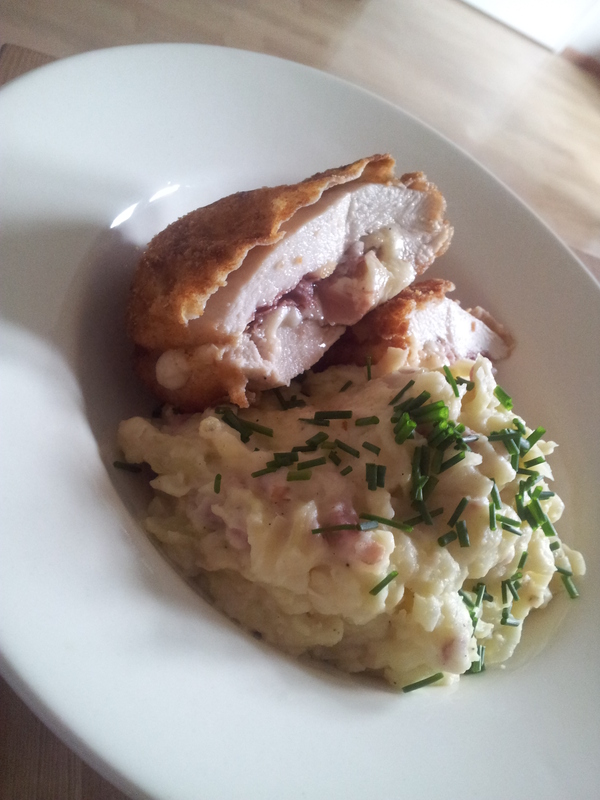 fry off your lardons, on a dry pan-they will release enough fat of their own. add your onions and fry until nice and soft, slightly golden. then add your mushrooms, and pepper slices. fry for 2-3min before adding the tomato puree, fry for 2 min more and add the water. season with pepper and paprika powder. simmer on low heat for about 10min- or until your potato cakes are done, and the sauce is thick. Check if it needs salt at the very end (don’t add the salt beforehand, the lardons will be salty, so only check at the end if you need any more seasoning). I came up with this one night, as an alternative to lasagne and oven-baked quesadillas. It did the trick and immediately became one of our favourites. 1) heat up 2 tbsp of olive oil in a deep pan and fry your onions and garlic, for about 3-4minutes, before adding the beef mince. fry it off until it’s nice and brown (about 5-6min on high heat), before adding oregano, chili, salt,pepper,sugar,cumin,coriander,paprika and tomato puree. mix it in well. 2) add your diced paprikas , corn and beans. add a splash (about 50ml of water) and simmer until it evaporates (about 5min). 3) grease an oven dish with the remaining 1 tbsp of olive oil, start layering your bake by 1/3 of the meat mix on the bottom, then tortilla,tomato sauce,cheese,tortilla,meat,tortilla,tomato sauce,cheese etc, until you ran out of ingredients. the last layer should be tomato sauce and cheese. 4) bake for about 30min in 180C or until the cheese melts and the top tortilla gets nice and crispy. 5) serve with a few green lettuce leaves, dressed with olive oil and vinegar. 1) in a heavy based pan , heat up your oil and fry off the spring onions, for about 2-3 minutes. add your brocolli and cover it with hot chicken stock, let it come to a boil and cook for about 2-3 minutes. 2) after 2-3 minutes the brocolli should be nearly cooked,add your courgette and peas , let the temperature come back to a boil and cook for futher 4-5min max. 3) at this point when everything is cooked, turn the heat off, and add your spinach, it’ll wilt within seconds. stir it through. 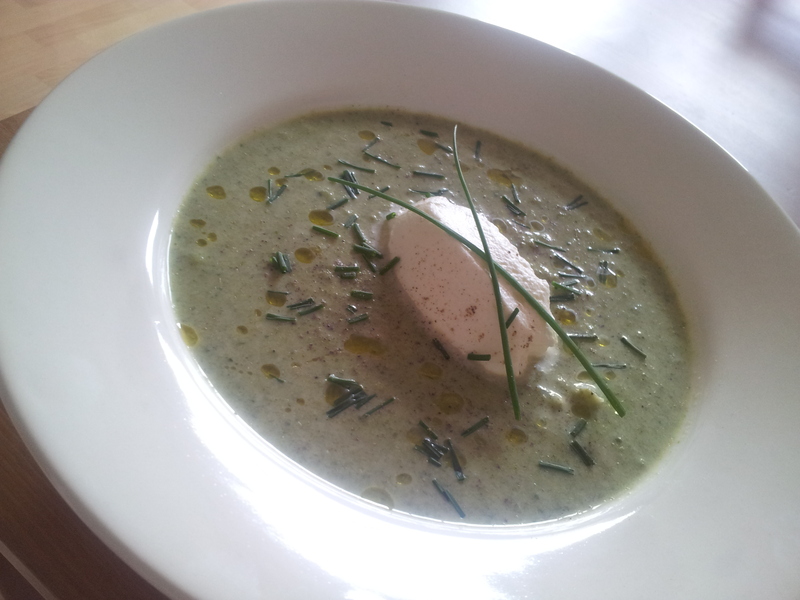 4) blend the soup until smooth, season with salt and pepper, you can add cream or yoghurt now. butter for greasing the baking dish. 1) take a large pot, and heat up some oil for frying off the spinach. throw in your spinach, and let it wilt for about 1min, once all the leaves are wilted- remove the spinach from the pot and place it into a bowl. You may have to do it in a few batches- depending on the size of your pot. 2) Once all of your spinach is fried off, suqeeze all the water out of it, and there’s a lot of it, so use your muscles 🙂 you don’t want a watery lasagne filling! when you squeeze the water out: chop it up a bit, I use scissors and chop it right in the bowl 🙂 then season the spinach with salt,pepper and garlic powder. set aside. 3) make your bechamel sauce, by heating up the butter in a saucepan, melt it completely before adding the flour. mix using a whisk, fry the flour off, to remove the raw flour taste, let it bubble for about 2-3min while constantly stirring. add your milk and keep stirring until the mixture starts to become thick. don’t let it boil like crazy, a very gentle bubble is more than enough. Once the mixture is thick and there are no lumps, turn it off, season to taste with salt,pepper and nutmeg and let it cool slightly (about 10 min) before adding 2 egg yolks. (once you’ve added them,stir them in quickly with a whisk,so they don’t scramble.) that’s your bechamel ready. 4) preheat your oven to about 160C, butter the baking dish generously. 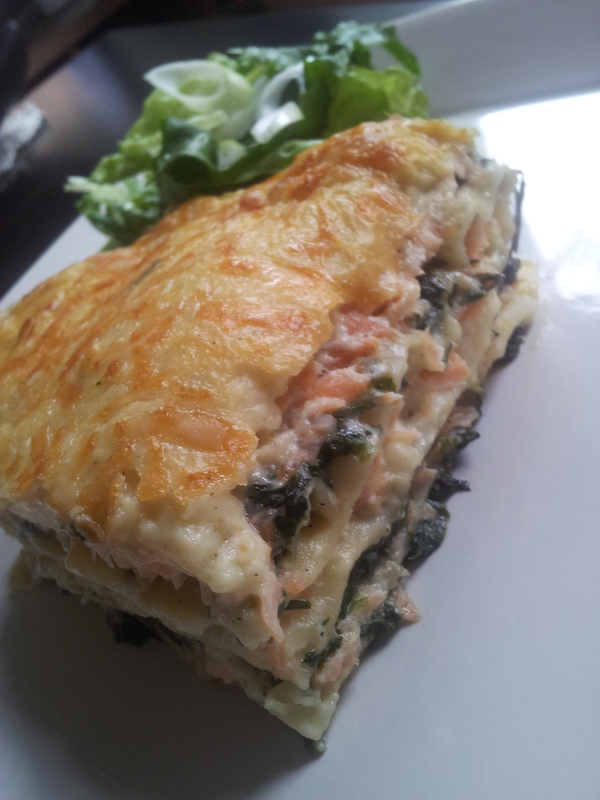 You will need to divide your spinach,salmon and bechamel into 3 portions, just so you can make sure you have enough of everything. 5) Making layers is pretty easy. you just overlap the layers, until you finish all the ingredients off. start with spinach and bechamel as a base and take it from there. All I do extra is that I put 2 tbsp of creme fraiche on top of the salmon layer,and smear it out-then add some dill and chives for extra flavour. (also,keeps the fish moist). other than that, you’re pretty much to layer them as you wish.. remembering that the last layer MUST be bechamel. 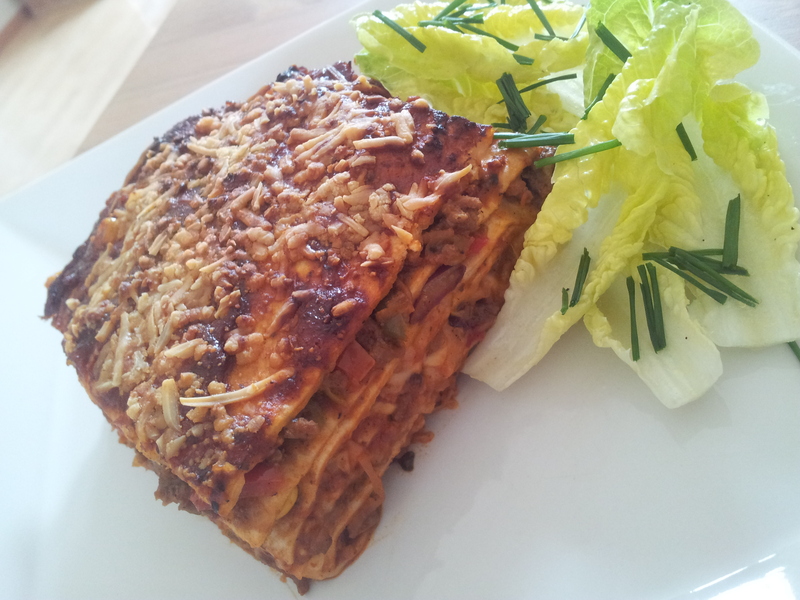 6) once you are finished layering the lasagne, sprinkle the top with a thin coating of parmezan cheese. bake for about an hour, or until the top is nice and golden, and the pasta inside is soft. 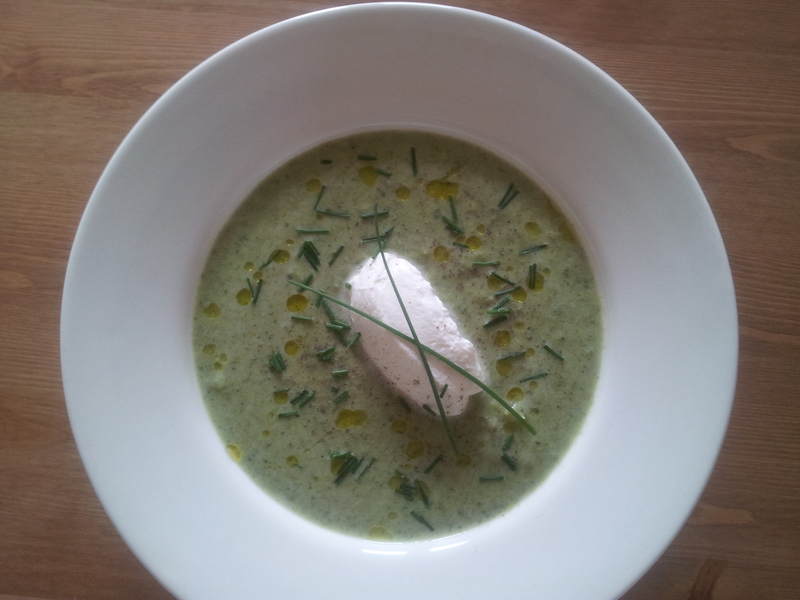 7) serve with a simple green salade or steamed brocolli. Dutch cooking is something I was never really drawn to.It seemed a bit too..hmm bland and not very exciting-no offense to anyone;)- I came accross this recipe while watching a dutch cooking show, and I’ve decided to give it a try-why not? I’m glad I did because it came out delicious, and even though I don’t cook dutch very often- this recipe will definitely become a part of my cooking repertoir. 1kilo of potatoes: peeled and cut into chunks (starchy ones will be good,they make a nicer puree). 1) put your potatoes into salted water and bring them up to a boil. it will take about 15-20min for them to fully cook. In the meantime fry off your lardons (in a separate,deep pan)so they’re nice and brown, add your cabbage, stir well, make sure the bacony-oil coats the cabbage well. add salt and a generous amount of pepper to taste. add a tiny splash of water and your granulated garlic,just to create some steam.Cook for about 10 min,stirring every now and then- the cabbage must be cooked through,but retain some of it’s bite. 2) Once your potatoes are fully cooked, drain them and let them steam dry for a minute. add your butter and start mashing. if they seem too dry, add milk- bit by bit, until you have the texture you’re happy with. (Don’t make it too runny, the cabbage will be mixed into it, and that will add some water to it). Make sure your mash is seasoned well with salt,pepper and nutmeg. then add your cabbage mix, stir it through well, combining all the elements. set aside,with the lid on for now, it’ll remain hot. 3) take your chicken fillets and pat them dry with some kitchen paper. Use a sharp knife to make an incision lenghtways- cut a pocket into the meat, but don’t cut it all the way through. just enough to make a pocket you can fill with ham & cheese with. 4) season the chicken from inside and out with salt and pepper, place 2 slices of ham and 1/4 th of your cheese inside the pocket,press firmly together, you can use toothpicks to pin it together tightly, so nothing falls out. 6) shallow fry on each side just so the coating goes dark brown and crispy, then take it out of the pan and place it in the oven, so the chicken finishes cooking through- about 10 min in 150C (depending on the fillet size) should do.